TCDM holds expertise in using a variety of in silico tools in mouse genetics and genome analysis packages providing accurate information on mouse gene structure and chromosomal localization. The genome data is used for designing and generation of transgenic constructs and multi purpose targeting vectors. TCDM is using new recombination techniques for rapid generation of constructs for various transgenic, knockout and knockin mice. TCDM has several readily available casettes and plamids for promoters as well as reporter and selection genes that can be applied in the generation of transgene or targeting vectors. Before beginning to design targeting construct, we recommend that the customer considers an option of using ES lines or targeting vectors from International Mouse Phenotyping Consortium. Gene modified mice are identified by ear marking. Ear punch biopsies are further used for genomic DNA isolation and genotyping. Genotyping PCR is performed using investigator’s instructions. Alternatively, TCDM can design primers and set-up genotyping PCR for the investigator. 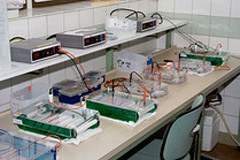 This service is primarily intended for gene modified mice being generated and bred by the TCDM for an investigator.